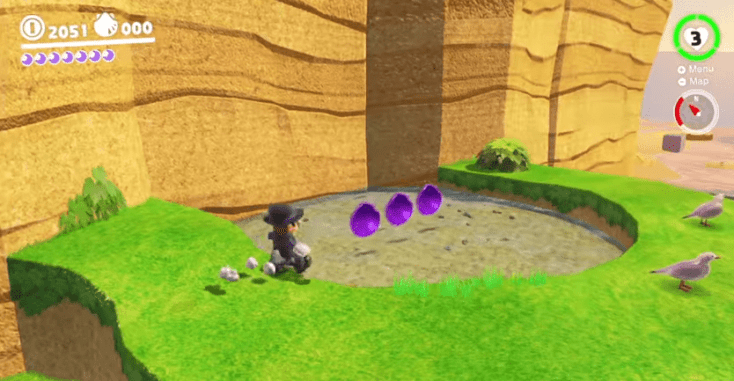 Know where each purple coin is located in the Seaside Kingdom by reading our Seaside Kingdom Purple Coin Locations Guide for Super Mario Odyssey. The Seaside Kingdom Purple Coin or Local Coin is shaped like a seashell that is often found in beaches. These purple coins are scattered around New Donk City. 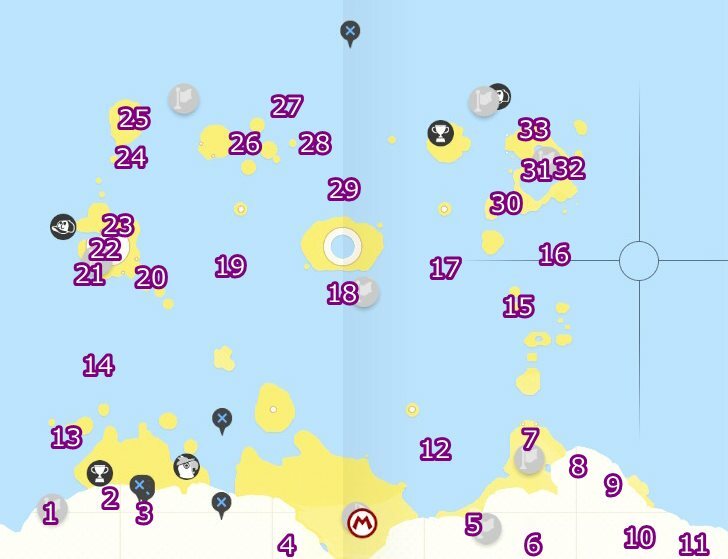 To help you find each purple coin in the kingdom, here is a Seaside Kingdom Purple Coin Locations guide which includes a map of where to find each Seaside Kingdom purple coin as well as some directions on how to get them in the kingdom. Capture a Gushen near the ring of gold coins in the island. Go to the grass ledge to the south and use the Gushen to go up and get the three purple coins. Go to the beach house and get the coins in the water to the west of the area. Go to the southwest of the beach house starting from the checkpoint, then look for the coins behind the beach chairs nearby. Starting from the Odyssey landing site, go to the cliff to the left and do a wall jump up the crevice in the area. Starting from the Rolling Canyon checkpoint flag, go north and dive down in the water between two pillars on a the cliff nearby. Get the purple coins on the crevice beneath. Go to Above Rolling Canyon and break the boxes behind you. There is a hidden trail behind the boxes, walk your way to the end of the trail and get the purple coins to the right. From the flag in the area, go to the west and look to the south near where you found Set 5, then you’ll see some purple coins in a small crevice in the cliff near the Rolling Canyon checkpoint flag. Climb up the cliff in the and look for the purple coins. Jump down the beach below the cliff and walk south to get the purple coins. 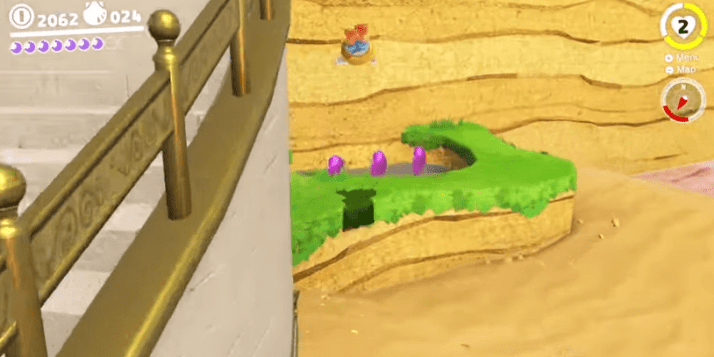 Climb up the ledge near the spiked balls in the area to find the purple coins. Dive down the water near the area where you get Set 8 and you will see three purple coins near the spiked balls. These coins are found in the shallow water to the northeast near the Odyssey. Starting from the Beach House checkpoint flag, go past the Ranking Board and dive down the water. Look behind you (towards the beach) and you will see three coins hidden in a crevice in the island. Starting again from the Beach House flag, go north and there will be a shallow part of the water in the area. Swim west and you will see three coins nearby. Go to the island specified on the map and get the purple coins underwater near a ledge. Go south of the Hot Spring Island checkpoint flag and dive down the water to get the purple coins on several coral platforms. From the Glass Palace checkpoint flag, go to the northeast and get the purple coins located underwater. Found on the lower platform underwater to the east near the Glass Palace flag. Head northwest from the Glass Palace Flag and you will see four green pipes underwater. Enter the pipe from the bottom right. Use the Koopa shell in an area near two question mark blocks to break a block at the bottom of the area. This allows you to get the purple coins to the right. Go to the east of the Lighthouse Flag and dive underwater. You will see a small passthrough underwater if you look back to the island. Get the purple coins by passing through it. At the Lighthouse, go to the entrance on the southwest side of the building. Get the three purple coins by walking to the right once you enter the lighthouse from this side. Enter the warp pipe near the Lighthouse checkpoint flag. 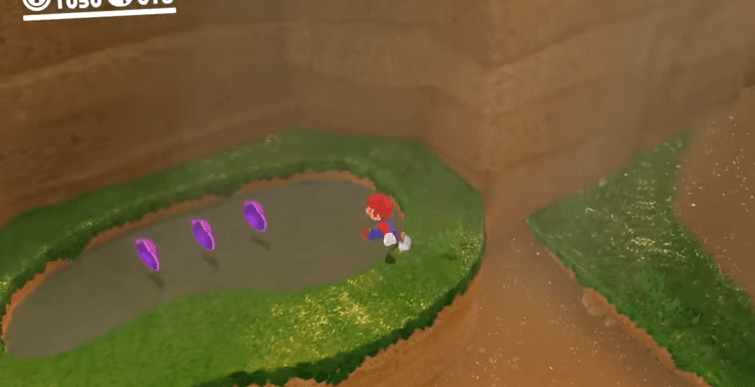 There are three purple coins located straight ahead in the tunnel. Beneath the small body of water next to the lighthouse. To the north of the lighthouse is a shallow body of water where several spiked balls are located. You can find the purple coins nearby. At the end of the tunnel where you got Set 24, look behind you to see the purple coins above the exit. At the center of the four islands specified in the map. These coins are underneath one of the islands. Go to the Ocean Trench East (northwest of Hot Spring Island). Capture a Cheep Cheep and swim west. The purple coins are on a ledge deep underwater. Head southeast from Set 27, and you will find several holes underwater, the coins are in one of the holes. Go past the treasure chest north of the Glass Palace flag. You will see a machine that makes large bubbles underwater. Go to the machine and you will see four purple coins. Go to Hot Springs Island and look for the purple coins beyond the umbrella to the southeast. At at lower platform underwater near the Hot Springs Island Flag. From the smaller pool of water in Hot Springs Island, jump down the water to find the Seaside Kingdom purple coin set. In a secret passage underwater beneath the umbrella to the east in Hot Springs Island.